like to play for their own enjoyment and for the enjoyment of others." 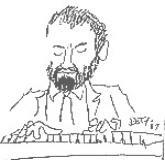 “Many piano players offer lessons, but Jack Tyrrell is a patient, talented, superb teacher of piano. I called Jack. He created a lesson plan tailored to me as an older adult having no piano experience. technically proficient, he is fostering a tastefulness in my playing so that it has both feeling and depth. third year now and enjoying the practice as much as playing the songs I'm learning." my love of music and the piano in ways I never thought possible." been taking piano lessons from him for five years. He knows his material and is able to give good advice."